Boiler controls make a big difference to your heating system. With our condensing boilers already operating at peak efficiency, our range of controls offer you an additional way of boosting your system’s overall performance and saving you money on your heating bill. There are different types of boiler controls, with each offering different functionality and benefits. 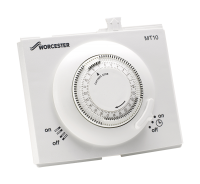 We at Worcester Bosch offer a range of controls including smart heating controls, digital controls as well as traditional mechanical controls. It's important to consider which type of control would best suit your lifestyle. Do you simply need the heating to turn on and off at set times, or do you require consistent, comfortable room temperature? Our guide to boiler controls explains the different types of controls available, and how they differ from each other. What type of control are you looking for? Control heating and hot water 7 days a week. Any controls installed with a new boiler are protected by the same no quibble guarantee that comes with the boiler. Terms & Conditions apply. View our range of controls for further details on what they do and how they work, before calling a qualified installer. Additional technical information relating to boiler controls and how they operate.